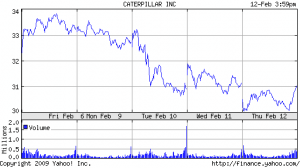 Visions of infrastructure spending keep dancing on the horizon for Caterpillar investors, who saw Friday’s close lop 7 percent off last Friday’s 33.28 finish. Full quote at Yahoo Finance. The indexes finished a notch lower: Dow, down 1.04%; Nasdaq, down 0.48%; S&P 500, down 8.35. Wrap-up at Market Watch. Cat’s volume of 10 million shares is about a third below average; maybe the bear’s found better-tasting berries to much on. 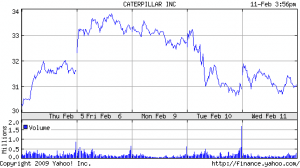 While Cat outperformed the indexes, it also closed within a dime of its low for the day. 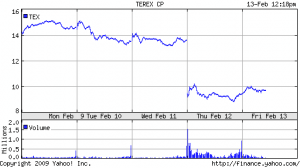 Given the thrashing Terex took yesterday, I wouldn’t look to Deere for good cheer next week. I was at my real job when Obama came to Peoria and Caterpillar CEO Jim Owens managed to muck up a pretty good photo op by doing that thing they taught us to do in Peoria when asked a direct question: say what you think the truth is. Mr. “Audacity of Hope” is not above exploiting fearful people’s hopes for better days to get legislation passed. Refreshing because it exposes him as politician vs. messiah. Mr. Yellow Father, however, has to answer to the people who have their personal fortunes (and $18 billion worth of stock) invested in his enterprise; he gains nothing by handing out false hopes. I don’t really think Owens and Obama contradicted each other: Obama’s package should help companies like Caterpillar stop firing and start hiring. Owens just said it would be farther down the road than many had hoped, and that more jobs may be lost before things turn around and hiring resumes. If this surprises you, congrats on returning from your vacation on the Mars Riviera. (I had to work late last night to get a story in the paper about a plane crash that killed 50 people … puts all this in perspective). Caterpillar started bad, rallied a tad, sank again and then bounced hard into the close to finish just a whisper from the green Thursday as the markets digested the possibilities of Obama’s Billions. Full quote at Yahoo Finance. Indexes did much the same: Dow, down 0.09%; Nasdaq, up 0.73%; S&P 500, up 0.17%. Wrap-up at Market Watch. 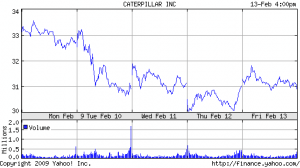 Cat’s volume of 13.6 million shares was a bit above normal, but the chart pattern is encouraging: a day when the stock tanks at the open and struggles all day, then surges into the close often means a rally’s in the works. Most notably: Support held at $30, as it has several times already in the past couple weeks. The theft of the Caterpillar in Yonkers last July, however, proved to be their undoing, as the suspect at the wheel of the $250,000 piece of equipment crashed into an overpass, sparking a multicar accident, authorities said. The Caterpillar kept going, but when a suspect later sought replacement parts for the damage, he was captured on surveillance video, giving investigators one of the clues used to indict 14 suspects. The group made its money selling stolen cars – including Porsches and BMWs – and construction equipment in several eastern states as well as in the Dominican Republic, Police Commissioner Ray Kelly said. “Some people smuggle jewelry out of the country,” Kelly said. “Other people smuggle Caterpillars and Hummers and large construction vehicles. The suspects made up for lack of finesse with sheer audacity. I guess the consolation during your stretch at Sing Sing is the admiration of your peers.